Waxoyl USA | Offering 360º of Protection from Corrosion. Trusted by specialists the world over, Waxoyl Professional makes customized solutions to retain value and the like-new qualities of all types of transportation, machinery and structures. How Can Waxoyl Work for You? Damage from corrosion can reduce your vehicle's value by more than half. Waxoyl Professional offers 360º of protection. Hardwax provides superior corrosion protection for all types of vehicles and exterior metal structures. Hardwax forms a tough, flexible, wax-based barrier that keeps the elements out while providing unparalleled chemical protection that completely interrupts electrochemical oxidization (corrosion) for all types of metals. From bridges to cars, Hardwax has a rich history of protection in a variety of applications. Hardwax is available in kegs, tins, and aerosol cans along with a variety of application tools. "Fogs" the cars cavities to provide total coverage, penetrating deep into seams for the ultimate protection from corrosion. One application protects for the life of the vehicle. Where surface rust already exists, Waxoyl Professional 120-4 stops corrosion in its tracks. Professional application tools snake through existing drains for complete protection without drilling access holes. Displaces moisture to achieve an optimum bond, even in damp environments. Temperature range of active protection from -40°F to 300°F. Safe on all paint finishes, rubber parts, electrical components, and it even lubricates window tracks. Professional 120-4 is available in kegs, tins, and aerosol cans along with a variety of application tools. Professional solutions to clean, polish, and protect vehicles inside and out. Waxoyl Professional Car Care products are designed to make every job quick and easy, yielding amazing results that last. Waxoyl Professional provides a complete range of car care products to clean, properly prepare, and protect your cars interior, exterior, and engine compartment. 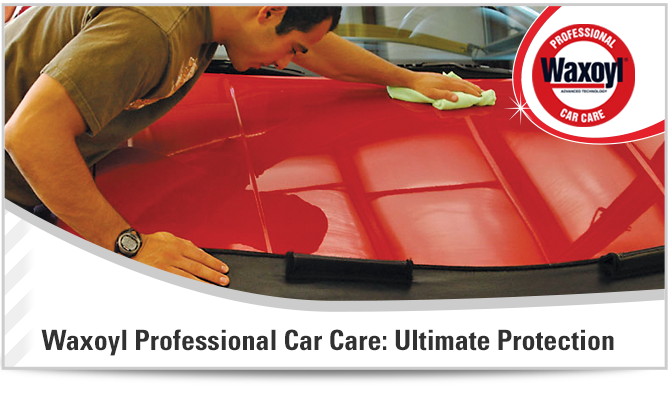 Waxoyl offers a complete range of paint prep and cleaning, paint protection, interior, and motor care products. Provides superior storage protection that beats the ravages of time by completely encasing items in a thin layer of wax. Topwax-6 delivers the ultimate protection from aggressive environmental damage. Ideal for protecting cars, buses, utility vehicles, construction machines, tools, rail cars, ships and airplanes. Protects all painted and unpainted surfaces on vehicles, machinery, machine parts and tools, etc. Topwax-6 is used to protect during transportation and storage and provides medium-term protection (up to six months) against environmental damage, e.g. acid rain, rust film, soot particles, etc. Storage protection is available in tins along with a tool. What are people saying about Waxoyl? The best part about Waxoyl is the tremendous value it delivers to my customers. With Waxoyl treatments, in 5 years their vehicle should be worth $5,000 more when it’s rust-free. It’s a no brainer for the customer... What more could I ask for? Judge us by the Company that we Keep. Here are just a few of the companies that use and endorse Waxoyl. Ready to start offering Waxoyl products to your clients? Waxoyl has been used and endorsed by leading car, bus and truck manufacturers, vehicle importers, PDI centers, train manufacturers, and heavy duty earth moving equipment manufacturers.